As I sat there at the clinic waiting for the doctor to see the baby son of one of our young ladies, I began to be aware of the snickering and finger pointing of several people in the waiting area. Curious to see what had caught the attention of those waiting with me I got up from my seat and wondered over to the area to which they were pointing. 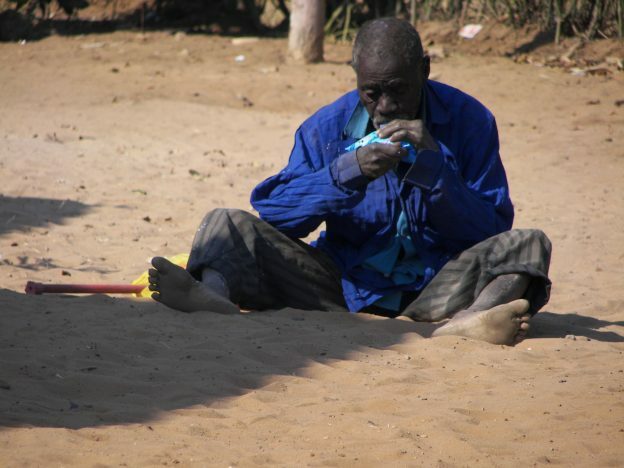 There, seated on the ground, was a naked elderly Zambian man taking a bath under the outside spigot. He was obviously enjoying the cool water on this very warm Zambian day, and was vigorously rubbing his entire body and head. His tattered, dirty clothing was on the ground next to him, and after scrubbing himself he picked up the clothes to scrub them under the running water. One of the young nurses was embarrassed and went to him, telling him he needed to dress and leave. With old cloudy eyes he looked up at her and said “I will beat you”, causing her to back away. I think she was really more embarrassed for me, a white woman, than his actual bathing. I just looked at her and smiled, telling her it was alright, that he was obviously enjoying his bath and was harming no one. I found out later this was a weekly ritual for him, and that the guards tolerated his presence as he had no home and no other place to bathe. After his bath he pulled on his wet clothing, slowly got up and limped away. As I continued my wait for the doctor my mind began comparing the mudullah to our lives. In our worn, dirty covering of “good works” we seek our own way to clean them, and even try to clean our lives with the ineffective water of self worth and self-righteousness. But our covering remains as filthy rags. We think we have stripped away everything others see, have cleaned ourselves, and cleaned our covering – but God lays it all bare for others to see. I have been teaching the ladies in our Bible study group on Fridays about the effectiveness of prayer and how to recharge our prayer lives. I think today reminded me that I need to recharge my own prayer life, asking God to lay bare to me the things He sees as filthy rags and for Him to create in me a clean heart. Next week when I take the little one back for followup, the mudullah will find a bar of soap and clean clothes waiting for him, as well as a small meal. He will also find a mzungu muchembeli missionary (white aged female) waiting for him to tell him of the One who can make him clean from the inside out. This entry was posted in Charlye's Corner and tagged aged, Charlye Price, clean heart, clinic, covering, doctor, missionary, naked, old man, prayer, self righteousness, self worth on 18/11/2016 by admin.